The Colorado Business Roundtable would like to extend our heartfelt congratulations to all of the candidates who stepped up to serve the residents of Colorado. We are so thankful to those who have served with distinction and wish you all the best in your future endeavors. To the candidates who were elected last night, congratulations. 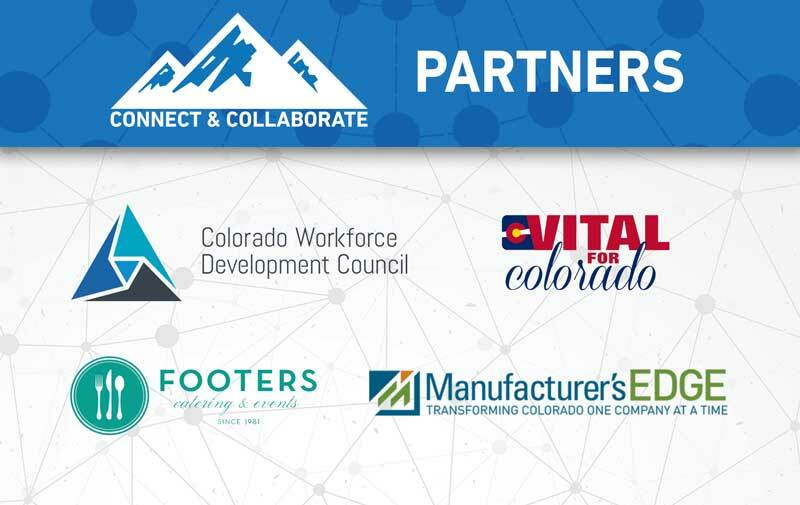 COBRT looks forward to working with each of you to ensure Colorado's business climate remains fair, balanced, and competitive. Businesses from all sectors have found Colorado's regulatory framework, low taxes, access to quality workforce, and quality of life the perfect environment to call home. We are committed to working tirelessly with you to find pragmatic solutions to improve our education system, fund roads and infrastructure, and ensure broadband access for all Coloradans. This Week We Will Be Announcing The Finalists For The Champions In Industry Awards Luncheon! Stay Tuned! Join us on Monday, December 3rd from 11:00 am to 1:00 pm as we recognize these champions and hear from our keynote speaker, Reggie Rivers, former NFL running back discuss his views on being a champion throughout his life. 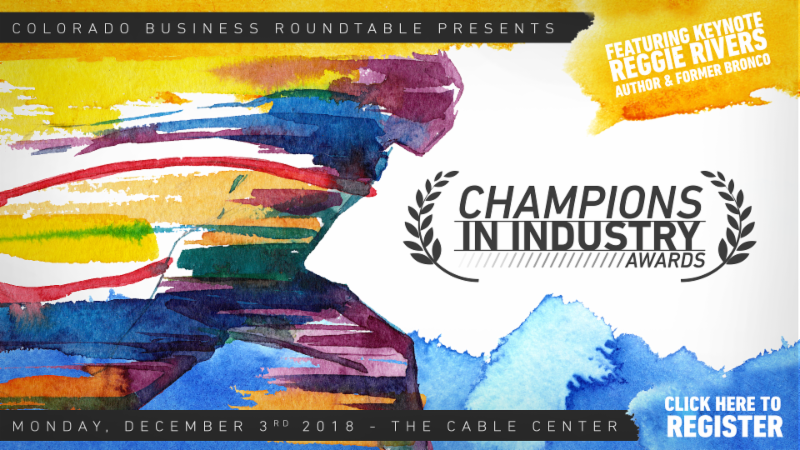 This event offers the opportunity for Colorado Business Roundtable to recognize the champions within Colorado who stand out and make a difference in their industry. If you are interested in being a sponsor for the Champions in Industry Awards Luncheon, please contact Lisa Gregg at 303-394-6248 or lgregg@cobrt.com. Democratic Congressman Jared Polis won a significant victory over Republican Treasurer Walker Stapleton Tuesday to become Colorado's next governor, a result that puts a successful businessman and entrepreneur into the top state office but worries company leaders particularly in the oil/gas and health-care sectors because of his promises to re-imagine how the state operates in those crucial areas. Driven by massive voter turnout, the 2018 midterm election was both a blue wave and a red wave. It just depended on which map you were looking at. Democrats blazed a suburban trail to wrest control of the House from Republicans, easily winning the popular vote in a national rebuke of President Donald Trump that is likely to yield a gain of more than 30 seats. And yet the party lost ground in the Senate, giving Trump and GOP leader Mitch McConnell more breathing room for the next two years - and possibly even longer. Democrats also fell short in some of the most sought-after gubernatorial races, including the biggest prize of the night in Florida. Colorado voters rejected requiring oil and gas wells to be at least 2,500 feet from homes and other occupied buildings, allowing the state's oil industry to breath a sign a relief Tuesday. Proposition 112, which would have made the half-mile buffer the law everywhere statewide except federal lands, was failing by a vote of 58 percent to 42 percent at the time the race was called by KUSA-9News. The blue wave that led Colorado Democrats to take back the state Senate and to keep the governor's mansion Tuesday also rolled down the statewide ballot, giving the party control of the attorney general's office, treasurer's office and secretary of state's office as well. That sweep of statewide offices gives Democrats control of all four statewide offices and both chambers of the General Assembly for the first time in at least 70 years. And it could have significant implications for the business community. 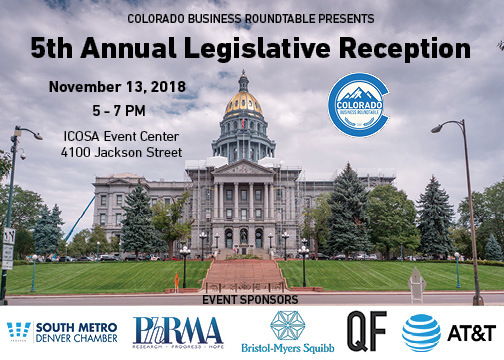 Next Week Is The Legislative Reception! Register Today! The Metro Denver Economic Development Corporation has produced Toward a More Competitive Colorado (TMCC) annually since 2004. TMCC is a longitudinal study of Colorado's competitive position as tracked by over 100 indicators grouped into eight major categories. The data stretches back to 2000, providing a look at how Colorado's business environment fared during some of the best and worst years in the state's economic history. TMCC provides data and trend lines for policy makers, businesses, and other community leaders to consider as they deliberate future policies and programs. Colorado Business Roundtable President Jeff Wasden was honored as a Business Champion for Children at the 2018 Global Business Summit on Early Childhood Education. 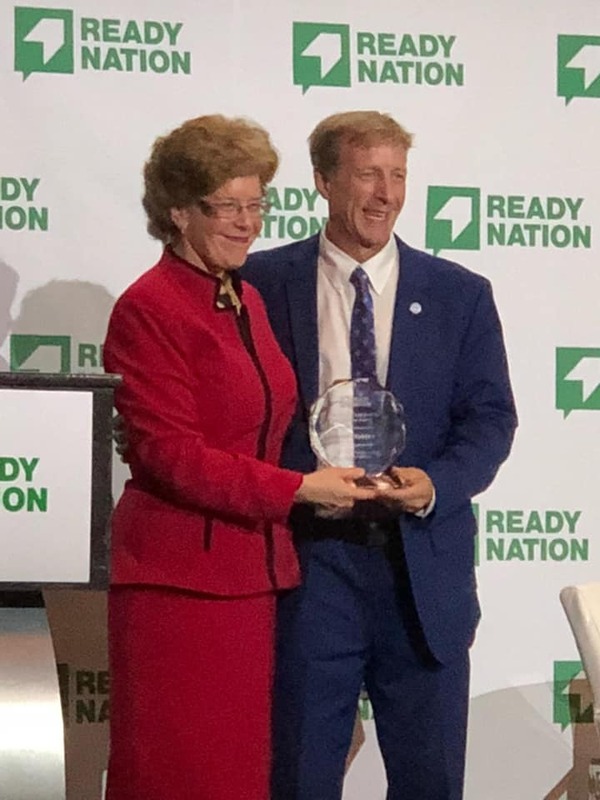 COBRT has been a key partner for ReadyNation here in Colorado, hosting roundtables, sponsoring the launch of their statewide report, testifying at the Capitol, and writing guest commentaries and letters to the editor. COBRT understands the importance of early childhood education as children develop the critical skills necessary to prepare them for lifelong learning. 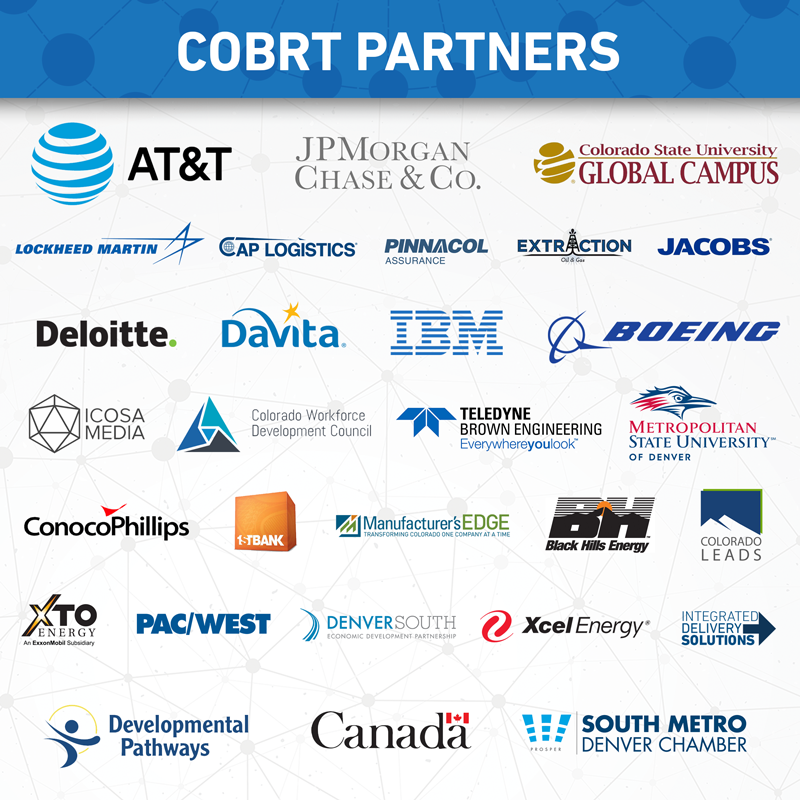 Education and workforce are key tenets of COBRT's work within Colorado and it was a great testament to the entire COBRT team. The Business Roundtable #EmbracingSustainabilty campaign completed its seventh week today with the release of a video by Wes Bush, Chairman and Chief Executive Office of Northrop Grumman. Also featured this week were A.O. Smith with Executive Chairman Ajita Rajendra and President & CEO Kevin Wheeler, and Bill Brown of the Harris Corporation. Business Roundtable launched the three-a-week CEO video program in mid-September and expects to continue the campaign through spring 2019. At a White House "Answering the Pledge" event Wednesday, President Donald Trump highlighted the commitments Business Roundtable companies have made to educate and train more than six million workers. In her remarks , Ivanka Trump thanked Scott Donnelly of Textron, who attended the event, for pledging to create 22,000 training spots for workers in the aviation sector. Lee Styslinger of Altec also attended, joined by a company employee, to reinforce the company's pledge of 1,000 new training spots. Ms. Trump spoke to the "enormous opportunity" to ensure that every American - in high-school, college or mid-career - gains the skills they need through a variety of training opportunities. 4-5 p.m. Monday through Friday or live stream online. Podcasts are available at http://www.cobrt.com/radio-podcast and on your favorite podcast app the day after live airing. See all at our events page and use this contact form to add yours! COBRT partnership opportunities are now available. Enjoy this week's newsletter? Have ideas that can improve the newsletter's coverage in the future?